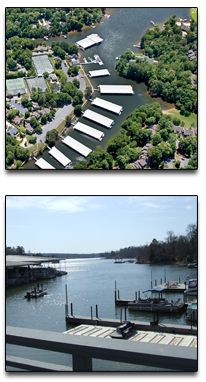 River Hills Marina is in the heart of the River Hills Plantation community, located in Lake Wylie SC, just outside of Charlotte NC. Designed and built by The Sea Pines Corporation of Hilton Head, the Marina provides boating and recreational activity opportunities for its members and the residents of this lake oriented community. The Marina offers both covered and open mooring slips harboring a fleet of lake appropriate watercraft: sailboats, jet skis, bow riders, ski boats, bass boats, pontoons, cruisers and houseboats all find docking space at River Hills Marina. Round the clock security is provided, along with public rest room facilities and casual relaxation sites. Many boats remain in the water for year round use. River Hills Marina offers it members and guests a true 'full service' approach to their boating needs. From protected dockage to seasonal light dining, marine fuel to nautical supplies, public rest rooms to seating areas, and lakeside viewing spots to relaxing walkways, River Hills Marina has it all. The Member Center is located at the River Hills Marina and serves as a community social center. It was developed to offer our members a private lounge facility for their use after a day on the lake or any time a social club environment is of interest to them. The Marina Club is also available to River Hills residents on a rental basis. For information specific to The Member Center at River Hills Marina, contact the Marina office at 803-831-1802 or by email at [email protected]. Pier 88 is located at River Hills Marina and offers a wide variety of boating related services to Marina members and boaters on Lake Wylie. Included in the Pier 88 offerings are a fuel dock (featuring non-ethanol 89 octane gas), pontoon boat and kayak rentals, and free pump out service, The Ships Store with boating equipment and apparel, and a café with for casual eating opportunities. Also a part of the Pier 88 offerings is the TowBoat US service facility. Contact Rikki or Paul Herrmann for Pier 88 details at 803-831-0088 or visit their website at www.pier88yachtclub.com. The Eddie Knox Pavilion is a part of River Hills Marina. This covered facility sits above the water’s edge, capturing the lake breezes while providing a spectacular view out Joe's Cove to the main channel of Lake Wylie. The Pavilion is large enough to host catered events for 200 and is available to River Hills residents for casual picnic activities. Rental of the Pavilion by River Hills residents or area non-residents is available at a nominal cost for weddings, reunions, birthdays or other special events. Contact the Marina office at 803-831-1802 (email [email protected]) for more information. In addition to the dock areas, Pier 88, The Marina Club and the Eddie Knox Pavilion, River Hills Marina houses the Marina Corporate Center, a three building complex framing an open air deck with views of the lake and the marina cove. This conference and business center serves as a resource for the community and the surrounding Lake Wylie area. Small to mid size offices are available to accommodate one to five workers comfortably. The professionally staffed reception desk is open Monday through Friday from 9 AM to 5 PM. The Business Center also offers a conference facility, free Wi-Fi, and administrative services to tenants and River Hills residents, including copy and fax service, typing and secretarial services, email, word processing, and postal services. More information is available by calling the Marina office at 803-831-1802 during normal business hours. The objective of the River Hills Marina Board of Directors to operate the cleanest, safest, most secure harbor facility for year round boating enjoyment on Lake Wylie. The Marina is proud of its continuing designation by the State of South Carolina Marina Commission as a Clean Marina. 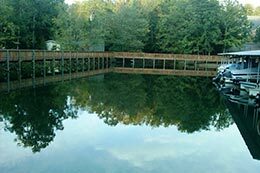 Recently, the Lake Wylie Marine Commission also extended it's Clean Marina status to our facility. The operating Board of Directors is made up of the following individuals: President - Jake Taylor, Vice President - Neil Nelson, Treasurer - Paul Herrmann, Secretary - Scott Neeley, Directors - Robert Chute, Anne Fletcher, Nick Nichols, and Michelle Transou. River Hills Marina offers very competitive resident member, non-resident member and commercial docking rates. The Marina Club is guided by a volunteer Board of Directors with all proceeds from the operation being returned to the members and the residents of the community overall in the form of improved ambience, safety and available services. In 2011, River Hills Marina completed a major upgrade of its seawall and walkway areas and is proud of the new River Hills Promenade that is now available to everyone. The Marina serves not only its participating membership but the entire River Hills community as a quiet and relaxing oasis in the heart of this active community. Many neighbors stroll the new Promenade and cross the Cove Bridge at the end of the Marina property. River Hills Marina is currently designated as a pet friendly area, and will remain so as long as pet owners use the available pet waste disposal stations.....please, scoop the poop!! Many members of the River Hills Marina also participate in other nautical activities in the area, including the River Hills Yacht Club, The United States Power Squadron, the US Coast Guard Auxiliary, and locally sponsored lake clean up events like “River Sweep”. Additionally, the Coast Guard group also offers free vessel safety inspections several times each year at the RHMC. There is no doubt in the mind of anyone who has visited River Hills Marina that this is the finest, cleanest, best looking, safest and most secure harbor and docking facility on Lake Wylie. We have extremely competitive lease rates on both our covered and open air docking slips. Come see for yourself. Contact the River Hills Marina office for membership and slip lease information. For more information on the River Hills Plantation community itself, please visit their website at http://www.riverhillsplantation.com/outside_home.asp. NOTE: The River Hills Marina extends its sincere thanks to the family of the late Bill Hopkins Jr. for allowing us to use some of Bill's exceptional photography on this site.